A distinction can be made between multicell clusters and multicell lines or squall-lines. The latter form when convection is triggered by upward motions along some type of boundary: for example, a cold front or a convergence line. The storms that form along a boundary will likely become organized along the boundary as well. Storms often become linearly organized when their outflows merge and a large, deep cold pool forms. In that case one single boundary can form, along which new convective cells are triggered. Note that environments of very low CAPE (a few 100's of J/kg) and very strong low-level shear occasionally produce those systems as well. Their characteristics are not yet well-understood. The other extreme, CAPE > 2500 J/kg, is quite rare in Europe. If there is no pre-existing boundary or front, a high coverage of convection is necessary to create a strong cold pool, the leading edge of which can function as the boundary that triggers new cells. Fig. 1.10. Radar reflectivity of bow echoes over southeastern Finland on July 5th, 2002 (left, source: FMI) and the western Netherlands on June 7th, 1997 (right). Squall-lines that produce strong winds usually consist of one or more bow-echoes (figs. 1.9 and 1.10). 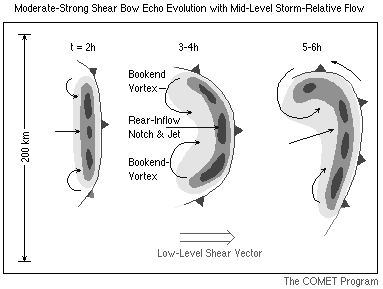 Bow echoes are typically 20-120 km long bow-shaped of convective systems that can produce long swaths of damaging winds. As bow-echoes mature, they typically develop two vortices at the northern and southernmost edges. Fig. 1.11. 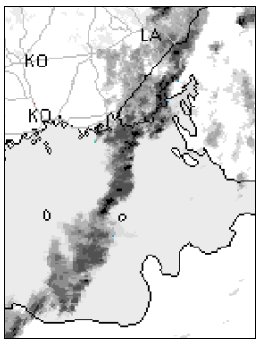 Radar reflectivity of a line-echo wave pattern over southeastern Finland on July 30th, 2001 (source: FMI). A long squall line can include several bow echoes (bowing segments). In that case, the system may be called a line echo wave pattern. In environments of high wind shear, the leading edge of squall-lines may be formed by many (very) small bows as in fig. 1.11. Intense windstorms caused by convective storms (usually bow-echo storms) that affect an area of more than 400 km in length are called derechos. These are essentially families of downburst clusters. They have been documented to occur in the U.S., Canada, Germany and Finland and other countries (Johns and Hirt,1987; Gatzen, 2004; Punkka and Teittinen, 2004). Fig. 1.12. Cross-section through a linear convective storm system. Arrows are winds relative to the moving storm system. A cross-section of a typical squall-line is drawn in fig. 1.12. Characteristic of such a system are two distinct system-relative flows: a flow entering the system from ahead that rises to the back (the front-to-rear flow) and a so-called rear inflow jet that enters the system from behind at mid-levels. In the most intense systems, the rear inflow jet remains at mid-levels until just behind the leading convective line of the system, where it descends to the surface and can cause damaging winds. Horizontal radar images of linear MCS's, such as those depicted in fig. 1.10., often show a leading line of vertical convection followed by an area of somewhat lighter rain and then a large zone of moderate or heavy rain. This stratiform precipitation zone typically develops as the squall line matures and old convective cells are left behind the growing cells along the gust front.